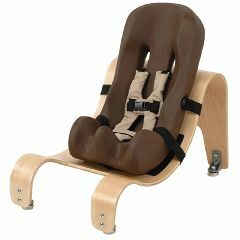 AllegroMedical.com presents The Special Tomato® Soft-Touch™ Sitter Seat - Seat And Stationary Base - Size 4. The Special Tomato® adaptive seating systems are available in various sizes, colors and modular offerings. Designed for children 9-14 years old, the Special Tomato® Soft-Touch™ Sitter with Tilt Wedge is your child's solution for proper seating. Developed with comfort in mind, the Soft-Touch™ Sitters are made from a soft-to-touch material that is impermeable to fluids and peel- and tear-resistant. The size 4 Soft-Touch™ Sitter can be used with the Wooden Tilt Wedge Base. Weight capacity: 50-110 lbs.